Isaac Flynn had always loved being a musician, having played in bands for most of his life while growing up in Kansas. But it wasn’t until he started penning his own songs a few years ago after a previous project ended that he fully began to understand the depths of his passion. Calling his new project Hembree, Flynn put himself through what he calls “three years of songwriting boot camp,” working on music from the loft where he lives in Kansas City. Looking to inspiration from masters of the three-minute opus like Tom Petty, John Lennon, and Bruce Springsteen, he started sending his demos around to friends and musical peers in the K.C. scene—but without telling them who was behind the work. The honest opinions were unanimously positive, and Flynn knew he was on to something. So, he started piecing together his dream lineup—because despite Hembree being his creation, he wanted the project to come to life as a band. “I assembled a group from people I respect as musicians but also want to spend a lot of time with—people who, like me, have committed their lives to music,” he says. The Hembree lineup now includes Flynn on guitar and lead vocals, Garrett Childers on bass and backup vocals, Flynn’s brother-in-law Eric Davis on keys/synth, and brothers Alex and Austin Ward on guitar and drums. The band began to gain a following after Flynn posted the song “Can’t Run Forever” on Soundcloud in 2015, picking up myriad listens and interest from labels. But it all seemed too fast for Flynn, who wanted to spend the proper time to form Hembree’s sound while learning what the band itself was and could become. It was a shrewd move for a 20something, owing to Flynn’s meticulous and optimistic nature. And so Hembree worked on their songs and live show, eventually releasing an EP and a grip of singles like “Holy Water,” “Had It All,” and “Continents,” undeniable earworms with infectious rhythmic elements that turned heads and found an audience organically. “Holy Water” became a hit on the radio, building upon local airplay to create a solid regional following before breaking through into the national spotlight, drawing attention from heavies like Spotify and Apple. This led Hembree to sign with the esteemed Nashville-based Thirty Tigers label group, giving the band more opportunities to get out in front of people and capitalize on the momentum through the sheer strength of their sound and live show. Through it all, Flynn remained dedicated to his craft and viewed the buzz as fuel for his creative fire. As the band’s star continued to rise—through more commercials and radio play, SXSW showcases, touring North America, and even an opening slot for Phoenix—Flynn continued work on what would become the band’s debut album, House on Fire. Working with producer Eric Hillman in Nashville, with whom the band had worked previously on prior singles, Flynn took the time to carve out his realized sound with precision and sweat. All the while, a theme was emerging in his lyrics, one he came to realize was simply unavoidable. Flynn calls the songs on House on Fire “scrappy,” a production vibe that that matches the grit of the lyrics and stories he is telling. The songs retain a high production value but possess the toughness and authentic character of the region from which they were created. The first single, “Culture,” begins with a sonic storm of synth and drum beats while Flynn sings “the king of the culture is never really free” as a mantra. The song was influenced by sampling and Flynn points to the boundary-pushing production, rhythm, and pastiche of hip-hop as a strong influence on Hembree’s sound in addition to classic beat-infused rock like Talking Heads, Blondie, and The Police and danceable indie music like Gorillaz and St. Vincent. “Almost” is an upbeat, 80’s-era stomper in the vein of Phoenix or later period Strokes with a laser-sharp fuzz riff that is sure to set the stage ablaze. “Skyline” begins with a confident strum before kicking off into the synth stratosphere and highlights the gorgeous timbre of Flynn’s voice, and “Heart” is a sentimental number built from the strength of its climbing chorus about putting insignificant things aside in order to embrace what you have in the moment. The ten songs on Hembree’s debut reveal a band filled with the confidence that is required of those who sound self-assured while discussing themes of indecision and uncertain identity. They took the time necessary to write the album they wanted to make, discovering themselves in the process. In fact, by the time the tracking began, Flynn and the band were so dialed in that the recording only took a couple of weeks—a stark contrast to the “boot camp” he went through in the writing phase. 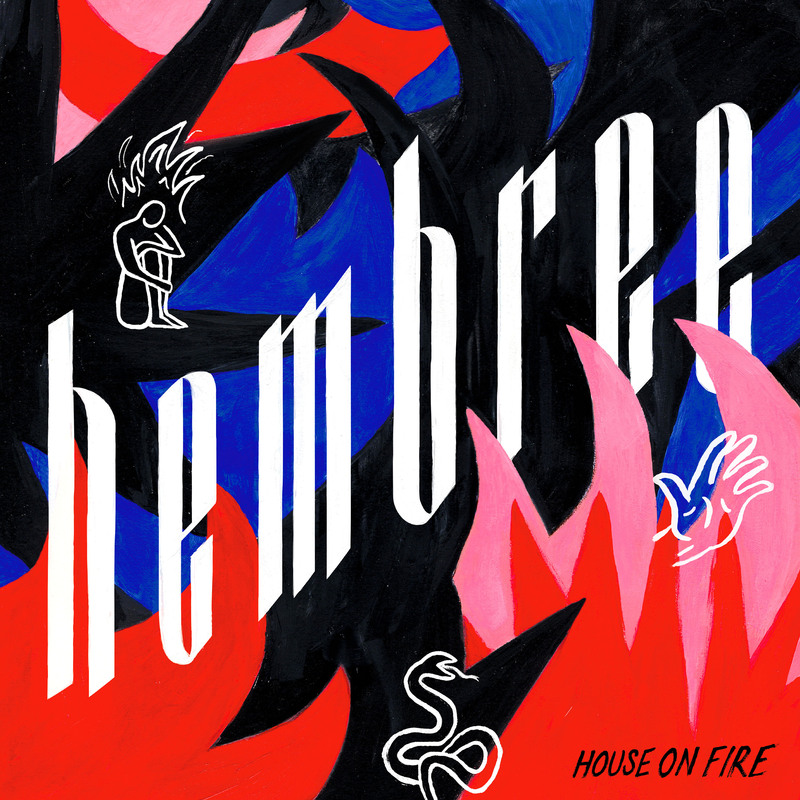 With House on Fire, Hembree have achieved what it takes some bands an entire career to replicate, a sure sign of their strengths in terms of songwriting, performance, production, and synergy. And it’s certain that from here they will only continue to grow.